There are plenty of reasons homeowners should have their ducts cleaned. In fact, having ducts cleaned every three to five years can allow for maximum cooling and heating efficiency. But many homeowners make the mistake of thinking they can handle duct cleaning themselves. With that in mind, let’s take a look at a few reasons to leave duct cleaning and maintenance to the professionals. They have the right tools: Cleaning ducts is not as nearly easy as cleaning other parts of your home. While light dusting and vacuuming can do wonders for removing dust and contaminants from your home, cleaning air ducts is a way to truly get your air system clean. And it’s not an easy job — professionals have the tools, knowledge, and experience to know exactly how a system works, what kind of damage to keep an eye out for, and overall what the best way to clean the system is. Without the proper tools and knowledge, you won’t be able to effectively clean the duct system. They’ll avoid spreading contaminants: When it comes to cleaning your ducts, it’s important to avoid spreading contaminants and chemicals that may be built up in the duct system to the rest of the house. Unfortunately, this can be difficult to do without the knowledge and experience a professional has. Unlike cleaning up other messes, you can’t simply push or blow the dust, dirt, and even mold out of the system, as this will just release them into the home. By using the right cleaning supplies, a professional duct cleaning crew can effectively remove contaminants without spreading them. They can handle complex jobs: There are some duct system tasks, like underground air duct restorations, that homeowners should never try to do on their own. Not only are some duct cleaning and repair tasks very difficult, but they can be dangerous too. There are a lot of delicate parts and complex equipment that has to be used when it comes to tasks like underground air duct restoration. And if something is done incorrectly, that could mess the entire system up. 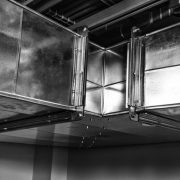 So any duct cleaning or maintenance should really be left to the professionals to ensure it’s done correctly and safely. As you can see, there are several reasons only professionals should handle duct cleaning and maintenance. So if you need your ducts cleaned, call a local company today. https://www.ductsquads.com/wp-content/uploads/2018/10/underground-air-duct-restoration.jpg 566 849 andwhat8371 https://ductsquads.com/wp-content/uploads/2015/07/White-Duct-Squads-09-150px-height2.png andwhat83712018-10-15 16:21:412018-10-15 16:21:41Why Should You Let a Professional Handle Duct Cleaning and Maintenance?